TruBlue of Honolulu offers professional handyman, maid and lawn care services in Manoa, Honolulu, Aina Haina, Waikiki, Kakaako, Waialae-Kahala and the surrounding areas. There are only so many hours in the day! By working with TruBlue, you can hand over your honey-do list and free up that time to spend with your loved ones or enjoying everything Hawaii has to offer. 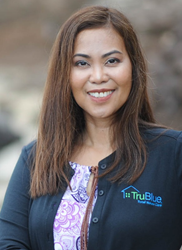 Kitchie McBride is pleased to announce she’s launched a new professional home maintenance company in Honolulu, TruBlue Total House Care. TruBlue offers handyman services, maid and cleaning services, lawn care, emergency repairs, seasonal projects, a home watch program, a senior accessibility program and more. TruBlue also partners with homeowners, realtors, and rental property owners to get homes move-in ready and prepared for market. TruBlue is also a great option for seniors who desire comfort and accessibility at home without the worry property maintenance. TruBlue of Honolulu serves Manoa, Honolulu, Aina Haina, Waikiki, Kakaako, Waialae-Kahala and the surrounding areas. Prior to launching TruBlue, she built her career working in clinical services, business development and revenue integrity in the health care industry. Working in an industry that served many seniors, she saw that there were gaps in services for seniors and their busy families – including the kind of home maintenance services TruBlue provides. “I was thinking about opening my own business and I knew I wanted something that was flexible and allowed me to work with people to improve their lives. With TruBlue, I can get to know my clients, build an understanding of their needs, create customized plans to suit their lifestyles and work with them to give them more time for the people and activities they love,” McBride said. TruBlue is a great optio n for busy families, seniors aging in place, families caring for seniors and anyone who doesn’t want to worry about home repairs, cleaning or lawn maintenance. McBride is especially looking forward to working with families who are caring for their older loved ones. For McBride, helping families keep their homes in excellent condition while they care for their loved ones is more than a job. “I have senior parents who don’t live in Hawaii and I can’t be there for them all the time. I’m hoping, through TruBlue, I can help other families both create great living situations for their loved ones and find more time to be together. I want to be a bigger part of this community through this business,” she said. All TruBlue franchises are fully insured and bonded and all employees are background- checked. To learn more about TruBlue of Honolulu, call (808)376-2772, email KMcBride(at)TruBlueHouseCare(dot)com or visit http://www.TruBlueHonolulu.com.